This is the section of our yard I lovingly refer to as the messy corner. 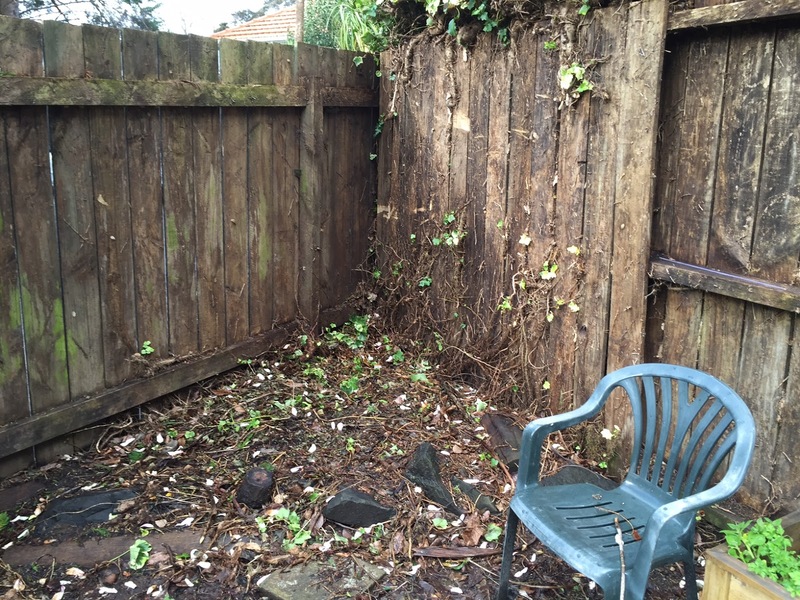 Riddled with ivy, that fence on the right used to be covered with chicken wire entwined with ivy that towered about another metre above the fence. Getting the chicken wire and ivy off the fence was relatively easy compared with digging ivy roots and a random tree stump out of the ground. I couldn't even tell you how many hours I've spent in this corner yanking, digging and sawing. But it was all worth it. 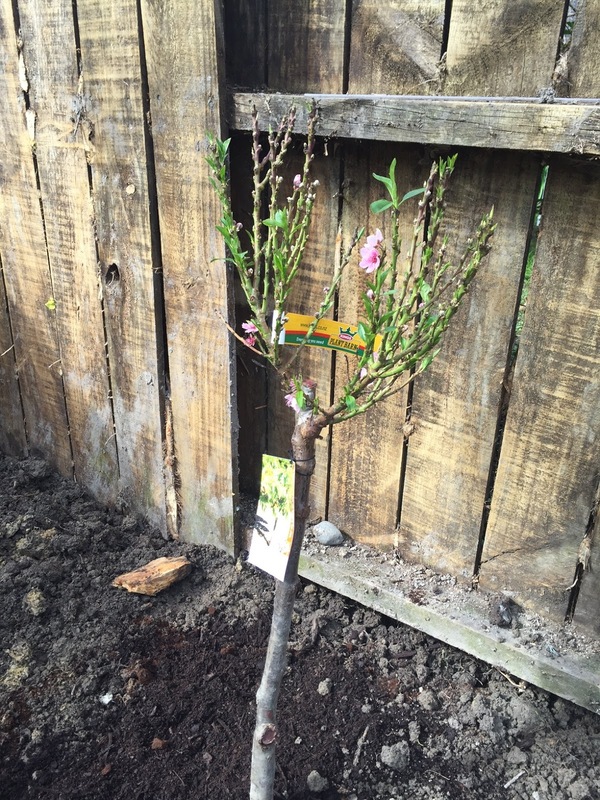 With the ground finally clear, this morning I was able to head to the garden centre and buy some fruit trees. And here they are. 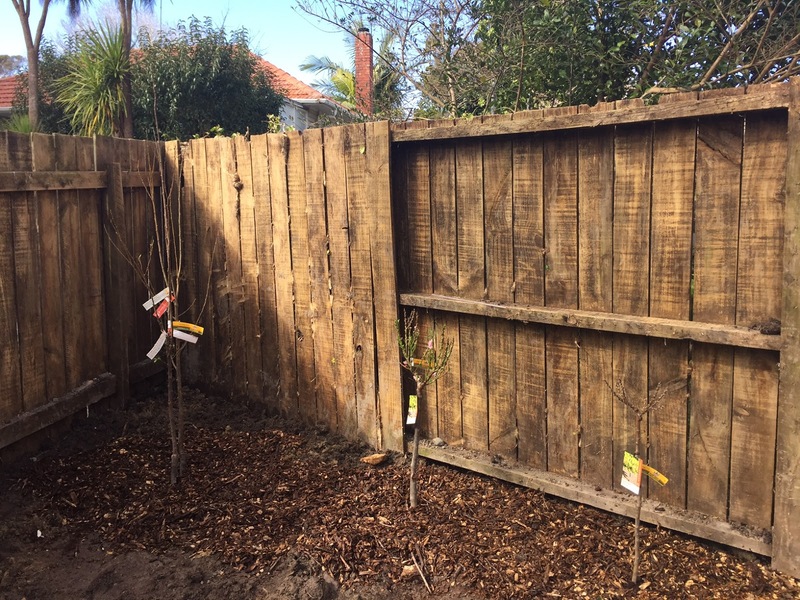 The tall tree in the corner is actually two plum trees planted into the same hole - a Plum Fortune and a Plum Santa Rosa. I had planned to buy a Plum Hawera, but the garden centre was out of them and Plum Santa Rosa was second on my list. It came with a Plum Fortune in the same container so I got the two and now we'll get twice as many plums out of the same space. 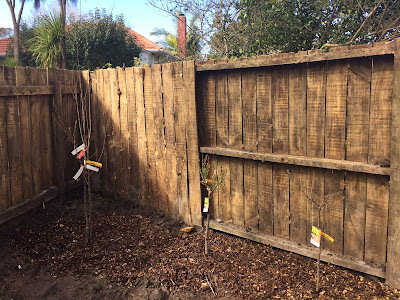 The two smaller trees on the right are dwarf peaches. A Peach Honey Babe and a Peach Rose Chiffon to be exact. 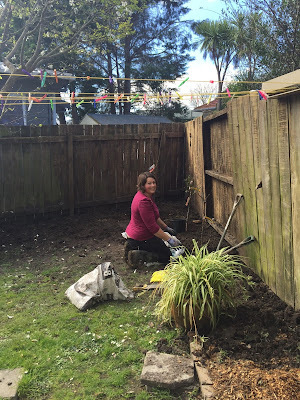 Here's a sneaky picture my daughter, S, snapped of me planting the Peach Rose Chiffon. My daughter also took this photo of the sweet little peaches. She is quite the budding photographer. 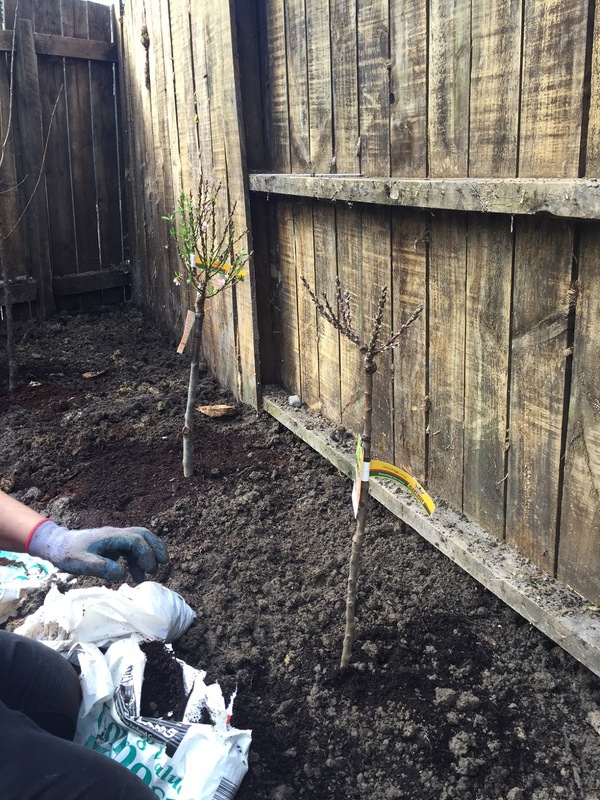 Here's a closer look at the two plum trees planted into the same hole. I'll be interested to see how they grow together. The Peach Honey Babe has already started to blossom. The flowers look gorgeous, but I'll need to pick them off this year so the tree can put energy into forming roots. This garden is what I look out at through my kitchen window, so I'm pleased it's no longer a messy corner. There's more to do, of course. I'm still edging the garden with bricks (and need to source more from somewhere). I also need to pick up a few more loads of wood mulch to get a good thick layer. 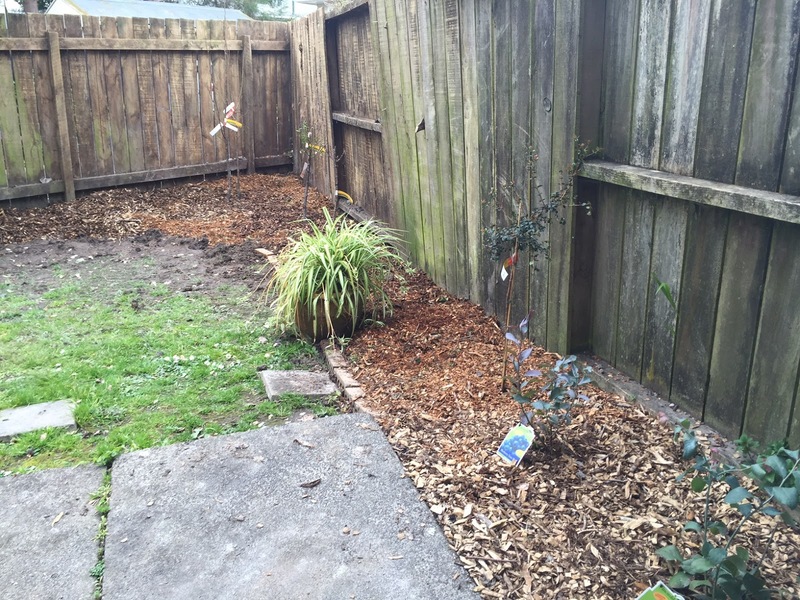 And I want to plant the understory between trees with lots of flowers and strawberries. 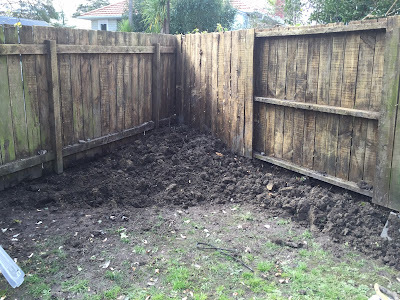 In the summer I'm planning to clean all my fences and possibly stain them (if I can ever decide on a colour). 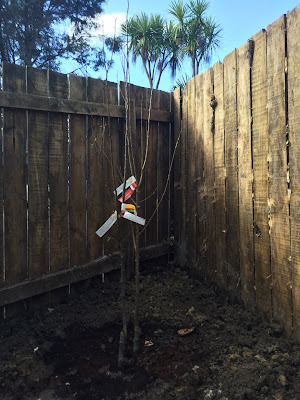 But for now, I'm getting my trees in the ground since that's the priority. I think by the time I'm done, I'll have 23 fruit trees around the place. Not bad. Not bad at all. Looks so good! I didn't know you could plant two trees together! Great tip for small gardens. You can also get single tees that are grafted with two different varieties, ie: One tree two apple varieties. Perfect for espalier along fences and walls.